Reviews of some commercial rice cooker models which include Zojirushi commercial cookers, Panasonic cookers, Aroma, plus more. Perfect for catering events or general commercial use, this 20 cup Zojirushi commercial rice cooker is one of the best-rated cookers on this page and will yield up to approx. 60 cups of cooked white rice (in rice cooker cup measurements). It is a basic rice cooker that is easy to operate as all the user has to do is measure correctly, plug in, and press down on a lever to start the cooking process. Once the rice is complete the Zojirushi NYC-36 will switch into a keep warm mode that can hold the rice at a moist ready to eat serving temperature for up to several hours without altering texture or consistency due to the well-insulated lid design. This Zojirushi cooker has an attractive smudge resistant outer stainless steel shell that comes with a non-stick bowl with water level guides, large serving spatula, and special measuring cup. It may be expensive, but is worth it for those who will use it often and who want a 20 cup rice cooker that is reliable. Tiger also puts out a great commercial rice cooker (model JNO-A360) that from what we gathered so far makes good quality rice with evenly cooked texture that produces consistent results after each use. 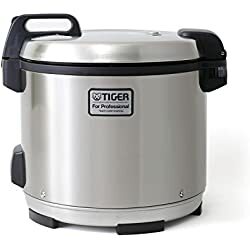 The high price means increased quality since this Tiger rice cooker uses an extra thick bowl for more even heat cooking along with a thermal sensor that release steam (temperature control) during the cooking process. When compared to the Zojirushi, it appears to be the better model, but for its high price it may not be for everyone. This product is more ideal for restaurant use rather than catering or general events that require large portions of good standard rice. But either way, for folks who prefer the best quality from a commercial cooker, this Tiger cooker appears to be a good choice. For a little less money, folks should also consider Panasonic’s line of commercial units. Although they may not be as good or keep the rice as moist as the above Zojirushi or Tiger models since they do not sport a sealed lid design, for the money they still remain a good buy for making very large quantities of rice. The overall cup capacity is around 23 raw cups which is good for yielding around 70 cups of cooked white rice, (remember 1 cup of rice equals 3 cups cooked rice). The description measurements are wrong on several sites and refer to water measurements. Operation is easy, just measure, plug, and press down on a lever. The Panasonic models also come equipped with keep warm modes that kick in automatically. Also, from what we gathered, some Panasonic commercial rice cooker units have a 220 volt power cord so folks may need to purchase a converter for use in 110v outlets, (please confirm with an electrician before use!). We also recommend folks check out Aroma’s commercial cookers as they too put out a quality product. When considering price, these are probably the best route to take since they are the most budget-friendly large rice cookers on this page. There are two models worth checking out which are the Aroma ARC-1033E (30 Cup Cooker) and the Aroma ARC-1130S (30 Cup Cooker). The Aroma ARC-1033E is a basic cooker with a removable top lid and digital display that includes a power on button and start button with “cooking” and “keep warm” indicator lights. So instead of pressing a lever, folks push a button to start the cooking process. The Aroma ARC-1130S is similar to the Zojirushi commercial rice cooker as far as design and build, but sells for around half the price. It features a one-press lever with keep warm mode and sealed top lid design for holding in flavor and moisture for hours during keep warm. Both units make good quality rice, come with non-stick bowls, special measuring cups with serving spatulas, and receive good consumer feedback throughout the net. A commercial rice cooker is perfect for those who need a unit that offers cup capacities beyond the largest consumer rice cookers which is usually capped at 10 cups. As mentioned on this page, commercial cookers range from 20 to 30 cups (60 to 90 cups cooked) and use a basic “rapid boil” style method when cooking rice. Currently there are no fuzzy logic (computerized) commercial cookers on the market that come equipped with specific rice setting as most seem to be simple one lever units that remain easy to use as well as clean. Overall, the brands and models we briefly reviewed on this page seem to be of good standard and should accommodate the needs folks require from a large commercial rice cooker. We will update this page as newer models become available.